The Sixth Suite is in a category of its own, separate from the other five. 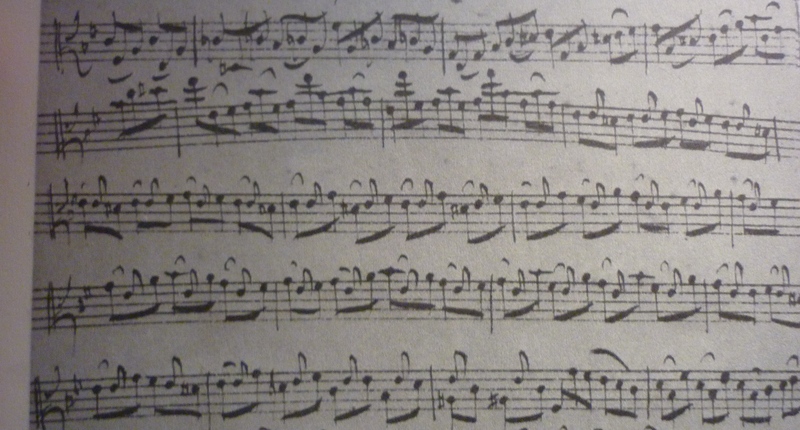 That’s because, as we can clearly see in Bach’s instructions at the top of the page, it wasn’t written for the usual four-string cello, but for one with five strings. There are lots of theories about what this instrument might have looked like. There’s evidence that some “normal-sized” cellos had five strings in Bach’s time, the top one tuned to the E a perfect fifth above the A string, though most of these have been cut down to size over the centuries. There’s also a more recent theory that he wrote all the suites for an instrument called the violoncello da spalla. Spalla is the Italian for “shoulder,” indicating that this was more like a modern viola than a modern cello. I tried to find a YouTube recording of the Sixth Suite played on this instrument, but the best I could find was a Dutch television broadcast of Sigiswald Kuijken playing some of the First Suite on one. It’s quite extraordinary looking: sort of like a half-size cello turned over sideways and played almost like a viola. I was amazed at Mr. Kuijken’s fluency and virtuosity on an instrument that looks so hard to play. I expect it would be murder on the tendons for most of us. I also have a wonderful CD of Anner Bylsma playing the Sixth Suite on a violoncello piccolo. Phoebe Carrai’s CD appears to have been recorded on some kind of 5-string cello, but I’m not sure what it looked like. It’s a goal of mine to get to play the Sixth Suite on some kind of 5-stringer one day. This said, most of us have to make do with the “normal” cello for playing the Sixth Suite, and in the absence of an E string, it’s fiendishly difficult. In fact, it’s more than fiendishly difficult. It’s so difficult it makes fiends look like harmless little pixies. Another issue with my plan to play everything from Anna Magdalena Bach’s copy of the Suites is the fact that large stretches of the Sixth are written in alto clef, which I do not read as fluently as I should be able to, considering that I’m a former string quartet player and spent many hours studying quartet scores, not to mention my other occupation as a professor of string chamber music and music theory (on top of my main duty of teaching cello, that is). For my own sanity, therefore, I learned the notes of the Sixth from Kirsten Beisswenger’s scholarly edition. I memorized it quickly, since one of my more dubious talents is a freakishly fast photographic memory for musical scores, although this doesn’t apply to anything else in my life that I’ve needed to memorize, such as the periodic table or any of my internet passwords. Then I transferred my attentions to Frau Bach’s facsimile and have read from that ever since. Today was a discouraging recording day. I really started beating myself up that I hadn’t learned the Sixth Suite at the age of 18 like everyone else. Why couldn’t I have been more like those good little boys and girls who got on with their practice, instead of swanning about writing daft poems and fancying myself as some kind of romantic heroine in outfits inspired by Pre-Raphaelite paintings of down-at-heel medieval princesses? I told myself after three very frustrating takes that it wasn’t too bad for someone who’d only just learned it and done really quite minimal practice on it, but I had quite successfully put myself in such a ratty, disappointed mood that I had to go home and play a vigorous game of fetch with my puppy to restore peace and equilibrium to my mind. The bit that gave me the most grief was a certain passage in E minor, where the absence of an open E string means you have to substitute your thumb if you’re going to get the implied string-crossing effect. In all my takes, I had a hard time getting up there, and I had a hard time getting the entire section in tune once I was up there. I stopped and did half an hour’s practice between each of the takes, but I could never get a recording of myself doing it cleanly. I suppose I can count today as one of the less good days of this project, alongside the D minor Menuets and the E flat major Bourrées. Today’s practice list: D major Prelude, Allemande, Courante, Gavottes I & II.